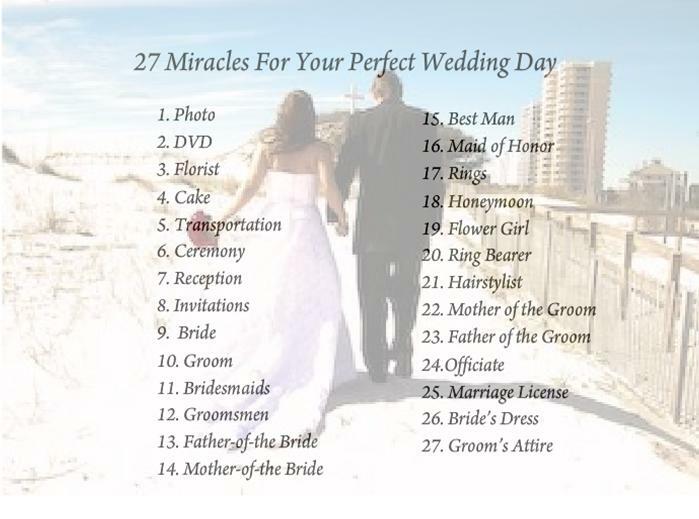 What are the 27 Things I need for my Wedding? Master Wedding and Event Planner Rosie Moore and her experienced staff provide 27 Miracles’ customers the ability to manage their wedding according to their own needs and wants. This approach carries into the planning stage so that every bride and groom have as much control as they desire over the most important wedding day decisions. We’ll discuss all your ideas at length then design a plan with a variety of options for you to consider. After you’ve given us the go-ahead, we’ll make it all happen and keep you updated regularly. With our extensive industry experience and contacts, we are well-positioned to create your memorable day for a much lower cost than you might expect. We’ll manage your entire wedding – or just certain elements of it (whatever you need).